Erasmus University Thesis Repository: Trade Policy and Poverty Reduction in Africa: barking up the wrong tree? Trade Policy and Poverty Reduction in Africa: barking up the wrong tree? This study investigates the relations between trade policies and poverty with the focus on the PRSPs which have become the main tool for poverty reduction in most Sub-Saharan African (SSA) countries. Africa and for that matter SSA has been said to assume the face of poverty and there have been efforts to reduce the menace (Ndulu, 2006). One strategy which has dominated the development agenda for poverty alleviation from the 1980s through to the 1990s is the PRSPs. The paper seeks to find out how PRSPs relate trade and poverty reduction and what has been the outcome of the mix. With regards to the analytical framework which rests on the assumption of trade policies, the study emphasizes that trade policies are relevant in any trade arrangement. This is evident in chapter two which discusses trade theories and its implications for the gains thereafter. The study reiterates that most African countries have implemented a number of trade policies such as liberalization. However, evidence from the study indicates that such policies often position SSA countries in their comparative advantage which is mostly static. The inability of SSA economies to escape their limitation to static comparative advantage rests on the failure to adopt strategic liberalization as was done in the case of South Korean and Taiwan. Moreover, the kind of industrialization policy pursued was inappropriate and inefficient. The result was that industrial policy on the sub-continent failed to yield the expected result. Thus, most SSA countries remain major exporters of primary commodities (Wood and Mayer, 2001). The paper posits that PRSPs actually consider trade-related issues but minimally. There is a greater focus on macro-economic stability achievement and other budgetary reforms in order to reduce poverty. Trade issues were not distinctively defined by the PRSPs; emphasis was on liberalization and export promotion policies. Findings of this paper however show that the EU and the emerging Chinese cooperations in Africa are not totally different strategies from what the Bretton Woods Institutions (BWIs) propagated. Although there are differences in approach, basically, they all aim at the objective of poverty reduction and preach the practice of trade cooperation. The paper therefore notes that what African governments must do is to critically assess the contents of what the new strategies to poverty reduction present in order not to repeat the mistakes of just signing agreements for aid. Anticipated effectiveness of aid therefore, must guide their choice for accepting aid for development and poverty reduction. 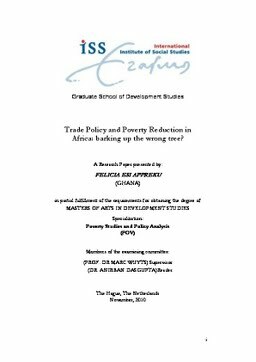 -- Relevance to Development Studies -- This study contributes to the vast literature on trade and poverty with a focus on how the PRSPs have dealt with trade issues and its contribution for poverty reduction. Although this is not entirely a new area, the paper looks at how PRSPs have projected trade as a mean of poverty reduction and often reduce trade to promotion of imports and liberalization police. The insight of this paper invites African governments and development agencies to reflect on their development philosophies and practice. Keywords International trade, PRSPs, SAPs, Trade policies, Poverty reduction, Alternate Trade Agreement, China-Africa cooperation, EU/ACP.